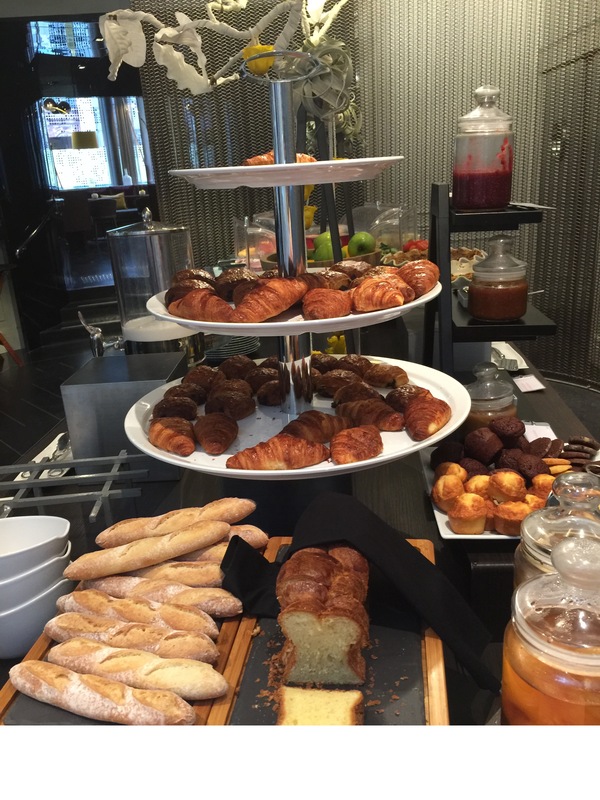 Much like our hotel in London, the hotel we chose in Paris included a buffet breakfast for us each of the 5 days we were in the city. The W Paris Opera hotel in the 9th andronissment was the hotel that my husband chose for us for the week we were in the City of Lights and it was the perfect hotel. 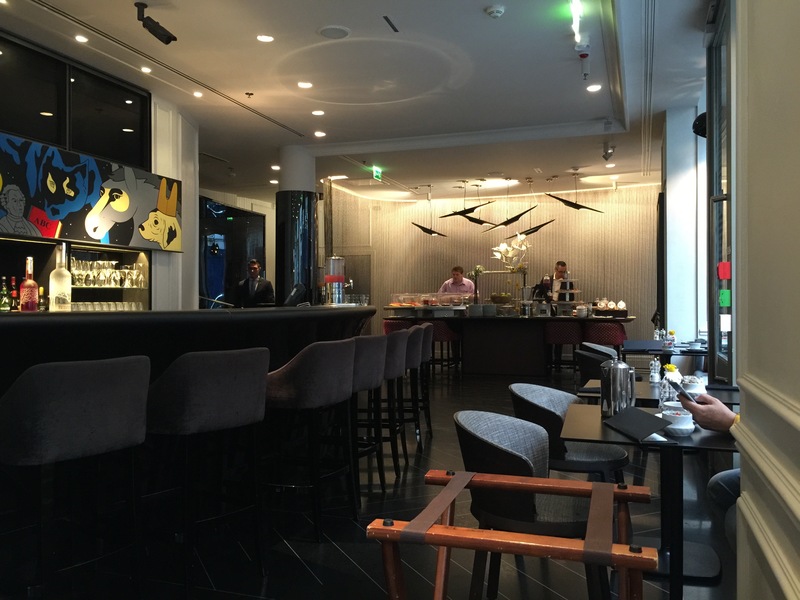 The hotel was a little quirky and a little artsy, but perfect for what we needed and perfectly Parisian. The location of the hotel couldn’t be beat as it was right down the street from a couple of Metro stops which basically gave us access to the most popular Metro lines as well as being directly across the street from the Opera, down the street from the famous Galeries Lafayette and within walking distance of the Musee d’Louvre. What better setting could you ask for? The hotel’s restaurant, Coquette, served up a wonderful buffet breakfast every morning along with serving lunch and dinner to hotel guests as well as guests who come to the Opera for a show. 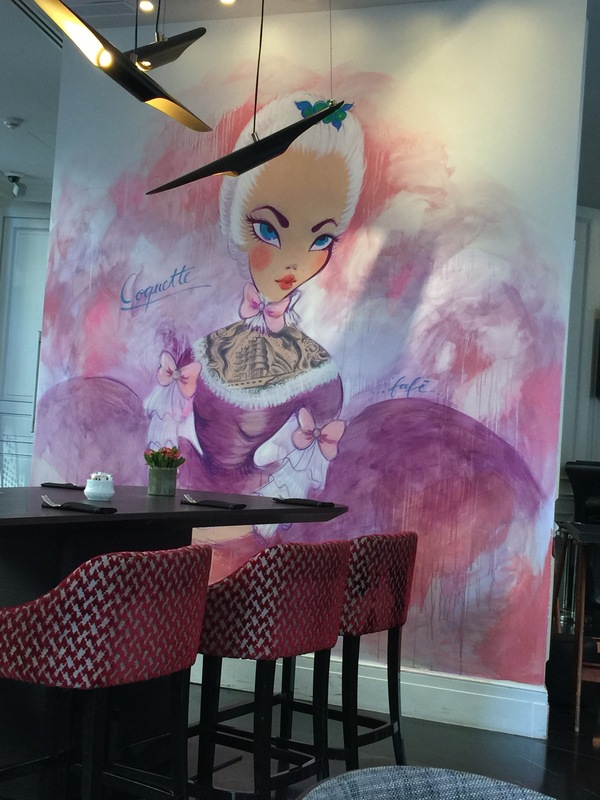 Inside the restaurant, they have a beautifully painted wall depicting their version of the wildly-popular Marie Antoinette. What else would you expect to see at a French restaurant? The buffet was set up along the far wall of the restaurant nearest to the entrance from the hotel. The dining area was long and narrow and led out to an outdoor patio. The buffet was set up in two parts, a small table filled with the hot dishes kept warm in warming trays and heat pads, and then a longer table with many cold offerings. 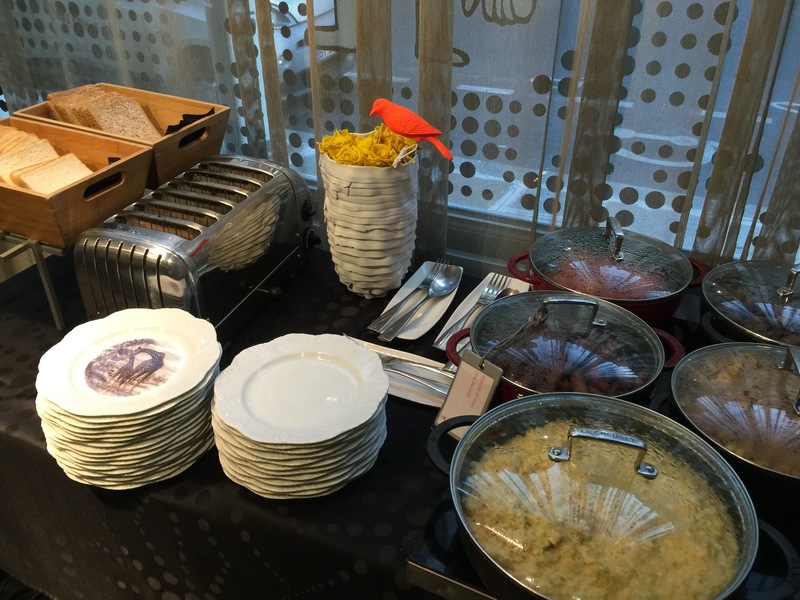 The hot offerings included scrambled eggs, sautéed mushrooms, sausages and roasted tomatoes. For the first day or two we were at the hotel, my husband who loves scrambled eggs wouldn’t touch them. I admit when I first saw them, they looked more like liquid egg rather than any form of scrambled eggs. However, one day, my husband decided that since they keep putting them out each day he might as well try it, and though they were soft scrambled eggs and unlike anything he’d ever had before, he really, really liked them. This must be a French way to scramble eggs that don’t look appealing, but taste out of this world. On this table was also an assortment of bread offerings – white bread, wheat bread, and some bagels – and a toaster to toast the bread. The cold offerings were plentiful and had a little something to offer everyone. There was smoked salmon with tomato and cucumber slices. 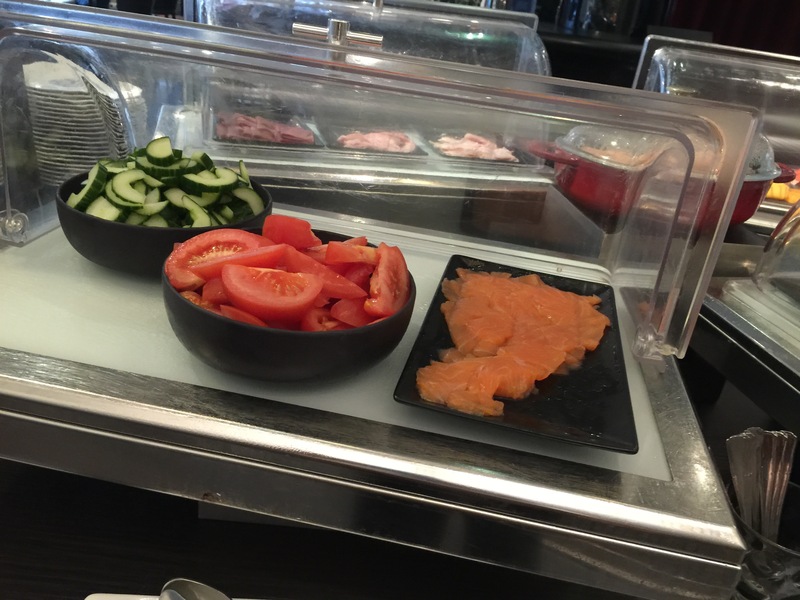 Smoked salmon seems to be really popular at all hotel breakfast buffets we go to. I might not always find bacon, but you can bet there will always be smoked salmon. For those who are more interested dairy products, there were a number of different cheeses, butters and fresh yogurt to be found on the cold offerings table. The yogurt seemed really appealing as it was served in clear glass bottles and just seemed quite fancy, but I’m not a yogurt-eater, so I didn’t partake. 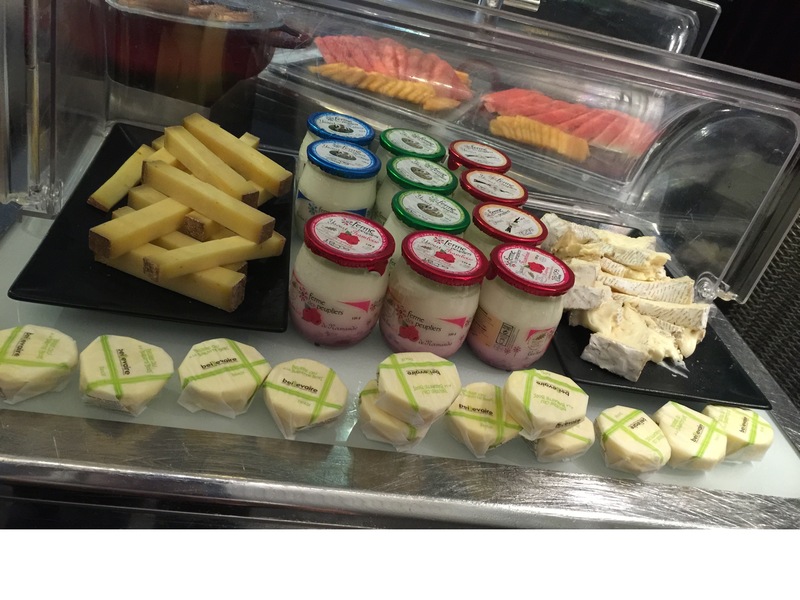 Of course, this is Paris, I think it would be blasphemous not to have cheese selections to go with any buffet meal. 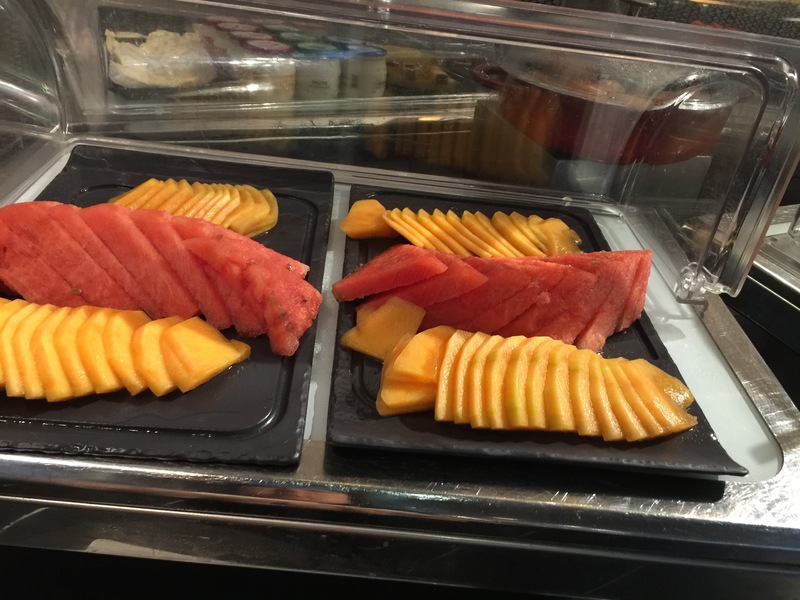 Fresh fruit in the form of apples, oranges, and sliced cantaloupe and watermelon could also be found every morning at the buffet. A nice health, and fresh alternative to start off the day. 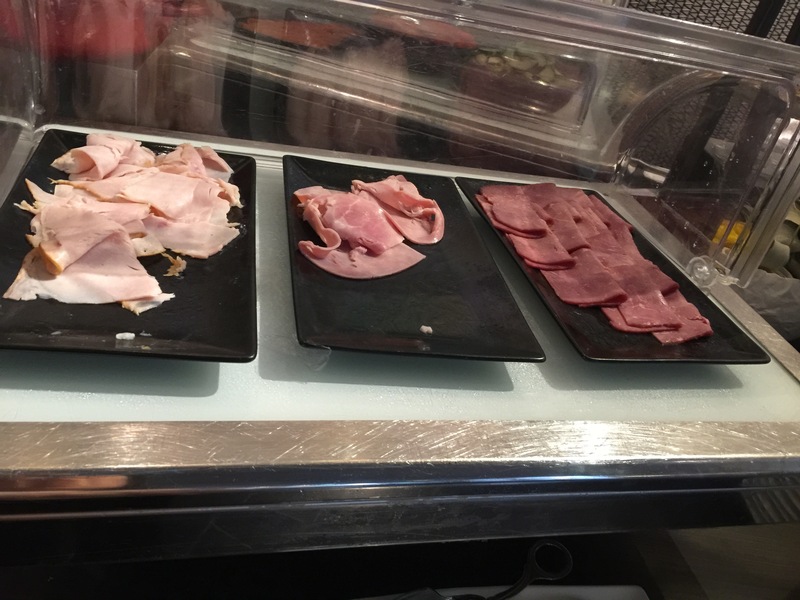 Plenty of cold cuts could also be found, sliced turkey and ham among other items available. 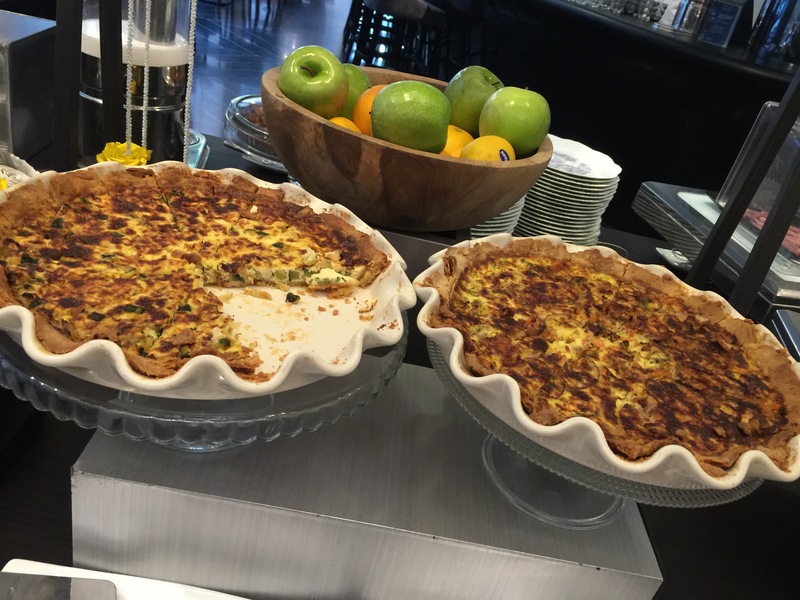 And this wouldn’t be Paris without some quiche in the morning for breakfast. Each day there was a fresh-baked vegetarian and ham and cheese quiche available for those looking for something a bit more traditional and substantial. 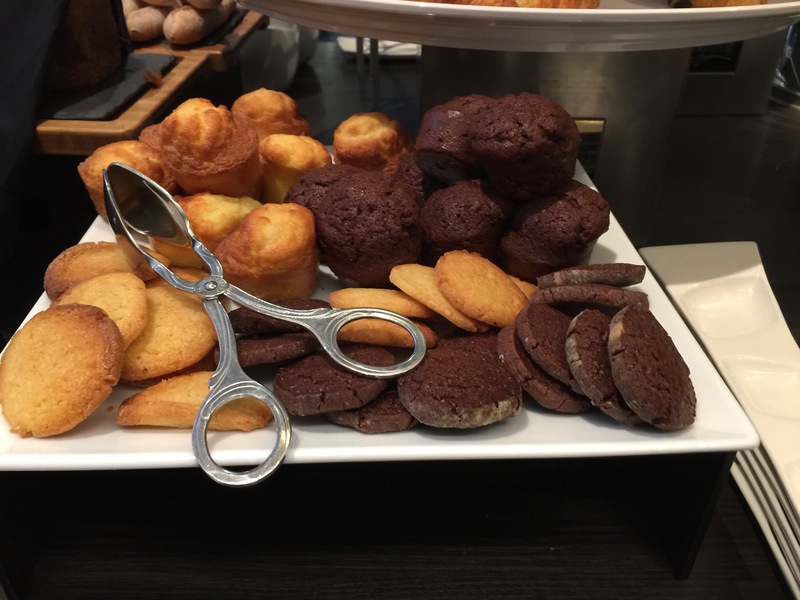 However, the items that really interested me at the buffet were the baked goods. Again, we are in Paris after all, land of the boulangerie and patisserie. How about the homemade vanilla and chocolate cookies and the little homemade mini cornbread muffins. I could have devoured cookie and muffin after muffin. But what my husband and I really loved, and just had to have each day was the fresh-baked mini baguette loaf. These little baguettes were the perfect size. You could tear it into a couple of pieces, slather it with some amazing butter and you’d have baguettes and butter. Fresh-baked baguettes in Paris are the best food ever, and my husband and I couldn’t get enough of them. 2 or 3 or 4 or 5 of these for breakfast is really all either of us needed. 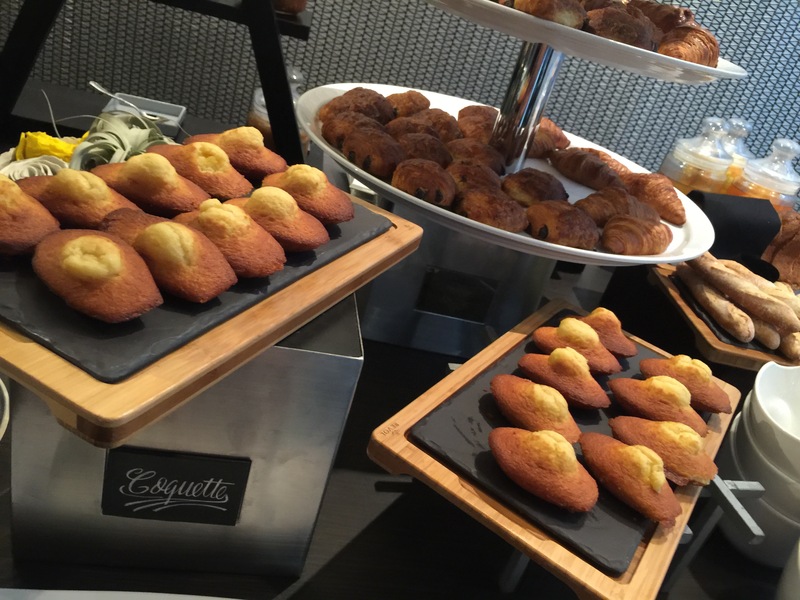 And for those looking for croissants and pain au chocolate (chocolate croissants), Coquette had those for breakfast as well. 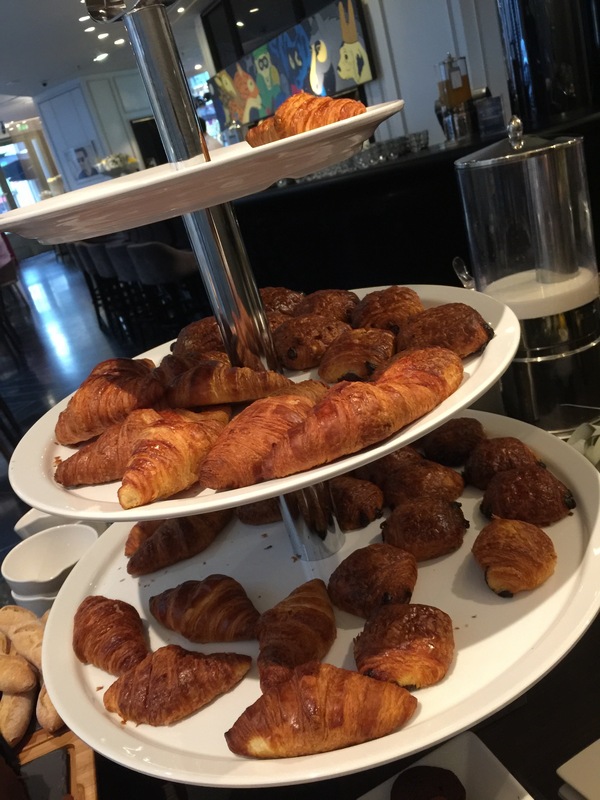 The chocolate croissants were terrific, rich and chocolatey and flaky and delicious. 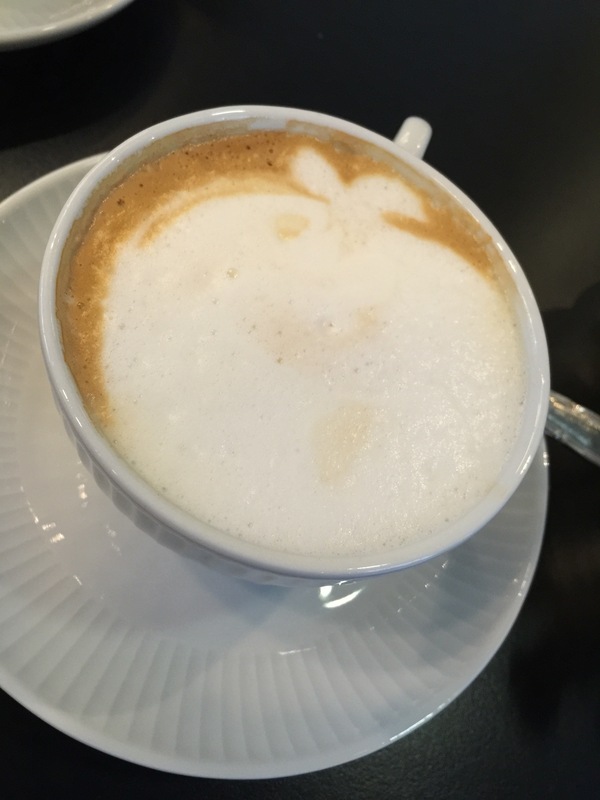 A little coffee, some fresh-squeezed orange juice, or a latte, cappuccino or espresso to start off your breakfast meal and you had everything you could ask for in a breakfast. My husband and I never left breakfast hungry. The selections may have been more minimalistic than we experienced in London, but each option presented to us was delicious. This was exactly what we were looking for. 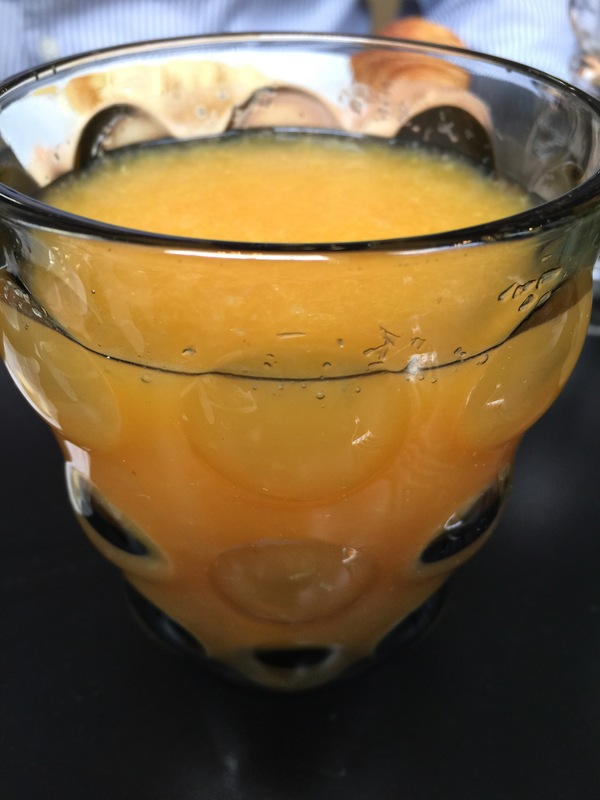 Simple, delicious food that is filling in the morning and gets the morning started right. 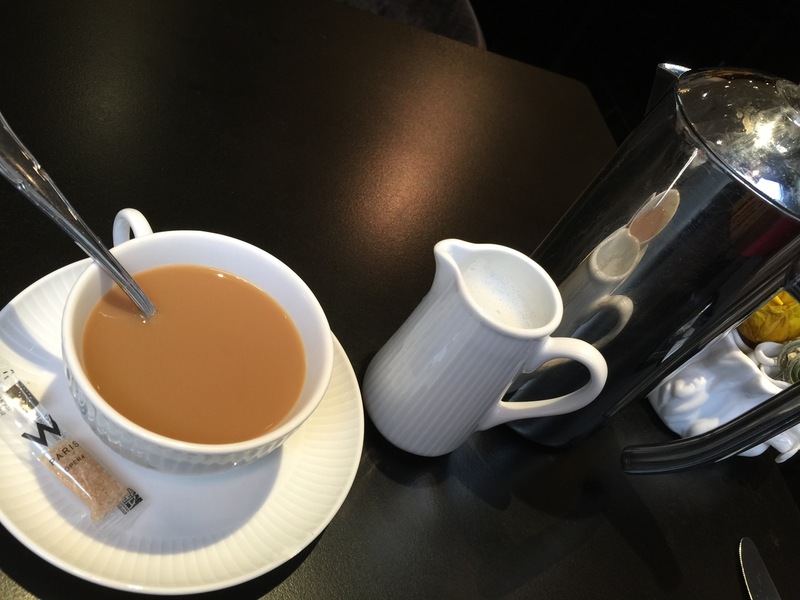 That is what breakfast is all about after all, getting a head start on the day.